Monday October 19th 1896 Bird and I took a ride this morning and went out to the cemetery. I stopped at Miss Lewis for a call before going down to the house to dinner. We rode most of the afternoon but called on Ella Rhodes. She and her husband spent the evening at the Harris House. Tuesday October 20th 1896 Soon after breakfast Bird took me to the depot. I had a very pleasant trip home. Will met me at the depot and we soon drove out home. he took Mrs Luse home and I put away my things and talked with Will after he came back. I certainly had the nicest time I ever had away from home for a week. It was year ago today that Charlie was buried. Wednesday October 21st 1896 Will helped me wash this morning and he cleaned and oiled the harness. We went down town in the Surry after dinner. We were over home awhile but came home early. I got the evening work down and read till bed-time. 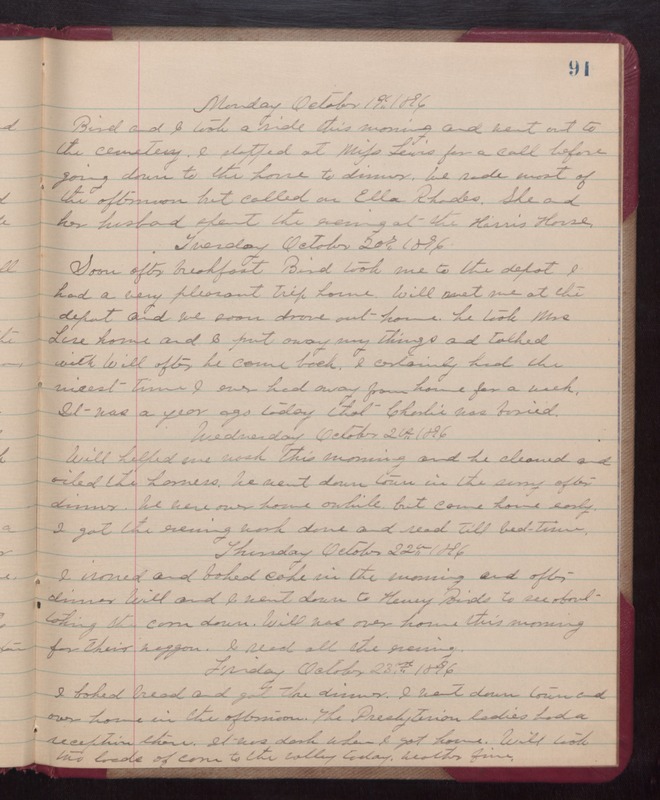 Thursday October 22nd 1896 I ironed and baked cake in the morning and after dinner Will and I went down to Henry Birds to see about taking the corn down. Will was over home this morning for their waggon. I read all the evening. Friday October 23rd 1896 I baked bread and got the dinner. I went down town and over home in the afternoon. The Presbyterian ladies had a reception there. It was dark when I got home. Will took two loads of corn t the valley today. weather fine.